Wii Play was released on February 12, 2007 with a MSRP of $49.99. The "game" was a compilation of nine mini-games, that used player created Miis from the Mii Channel; but not only did gamers get the nine mini-games for $49.99, they also received a Wii Remote with the package. Wii Play received an ESRB rating of "Everyone" with "Mild Cartoon Violence" listed as content for gamers/parents to be aware of. How many hours have Wii owners reported playing the most sold video game of all time, with 1,583 days reported? Let's take a look! shown are not for all Wii owners that have played Wii Play. 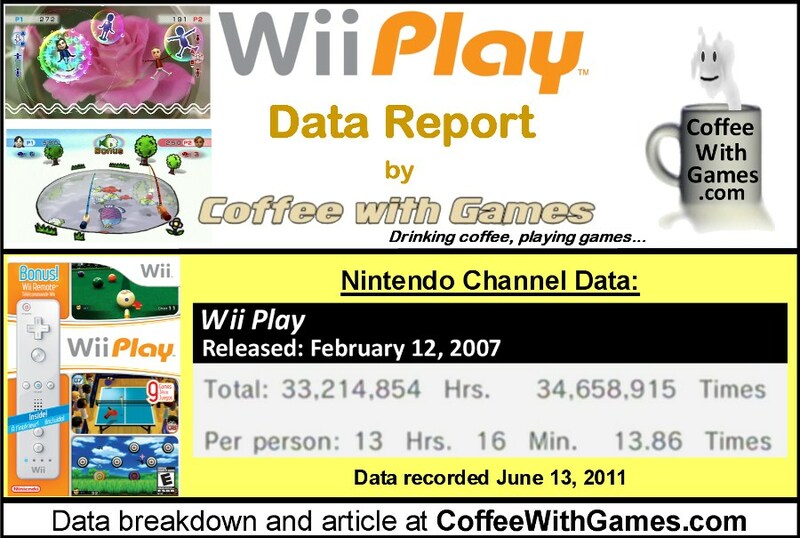 Wii Play has had about 2,500,643 Wii owners report their play-time data through the Wii's Nintendo Channel, with 1,583 days of game-play reported since it released. 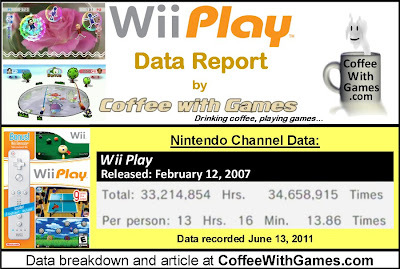 Wii Play has 33,214,854 Total Hours of game-play reported, with an average play-time of 13 Hours 16 Minutes "Per person"(or console) that has reported data for the game. The game's average play-time per session is right about 57 minutes. As of March 2010, Wii Play had sold more than 27,000,000 copies world-wide, making it the most-sold video game ever. 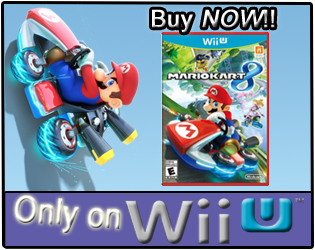 Wii Play's Amazon.com sale rank is #667, and it is currently selling for $28.99. Sale rank and advertised price were recorded on June 20, 2011 around 1:45AM. Wii Play's "professional" review score average is 61.72%, based on 41 reviews on GameRankings.com. The game currently has a 3.5 out of 5 Stars rating on Amazon.com, based on 833 customer reviews. Wii Play's customer review score average is 72.79% when the reviews are converted to a 100% review scale. While I don't own Wii Play, I played a friend's copy of it briefly. If I had not already owned four Wii Remotes when this bundle released, I probably would have purchased it. Knowing that Wii Play is currently the "most sold" video game ever is interesting, but perhaps not unexpected considering the Wii's success. Wii Play was released world-wide for the Wii within just 3 months of the console's release in November 2006, and was bundled with a Wii Remote for only $10 more than a Wii Remote's normal asking price then. As for the game's reported game-play hours, I think they are very good for this type of game. Considering it's a compilation disc of mini-games, seeing Wii Play with an average play-time of more than 10 hours I think is really good. If you missed my recent post, "Michael Pachter on Wii Play Motion, A Year Ago", I showed how Mr. Pachter and I had exchanged some emails, and I thought early last year that Nintendo was phasing out Wii Play, to introduce its sequel which I called, "Wii Play Plus", at the time. Well, if you are not aware, a sequel to Wii Play was released last week called Wii Play Motion. Wii Play Motion was released on June 13, 2011, which was 2 years after the Wii MotionPlus unit was released...and that's a business decision that still doesn't make any sense to me at all, but perhaps I'll discuss it more later. If you own Wii Play, and you have had it for a few years now, do you find yourself still playing it occasionally? Also, do any of you find it odd, like I do, that Nintendo took more than 2 years to release Wii Play Motion after the Wii MotionPlus unit had been released? Those numbers are absolutely astounding. but not surprising given the circumstances this game was released under. I don't own a copy of the game myself, but I've spent quite a bit of time on it, and it's a good little collection of minigames. Nothing brilliant, but worth the $10 investment, and a smart move from Nintendo in "teaching" people how to use the Wiimote for bigger or more complex games later. I played alot of laser hockey and billiards back then and wished that they had some more depth to it after a while. Still it was a no brainer to buy the bundle instead of a remote alone for that price. I still only own 2 Wiimotes and no motion plus either and do not plan on getting any (more) except maybe a wiimote plus in case a game comes out I really want. Not sure about Zelda yet, which is probably the only "core" WM+ game to come out anyway until the Wii is done and gone. 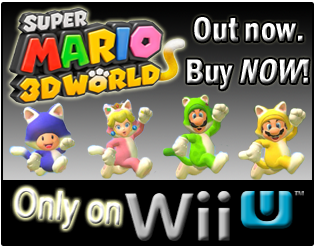 Curious how Nintendo will handle this with the Wii U. The regular remote is still supported and I assume that is going to keep back devs once again to go WM+ exclusively. On the other hand I'm already expecting most to not bother with anything but the standard controller anyway. Although if only one Wiipad is going to be supported, then they pretty much need to support the Wiimote. Just wish that WM+ would be required to ensure devs will actually be using it. not only was there the wii sports resort WM+ bundle, but you're completely forgetting about the flingmash WM+ bundle also. We had it, but mostly just for the extra controller it packaged with at the time. Hardly anyone really played it. There was just a lack of depth that made it seem like more of a novelty than anything, in our household. "... a smart move from Nintendo in "teaching" people how to use the Wiimote for bigger or more complex games later." Which is why I'm surprised a Wii MotionPlus sequel took so long. "I still only own 2 Wiimotes and no motion plus either and do not plan on getting any (more) except maybe a wiimote plus in case a game comes out I really want. Not sure about Zelda yet, which is probably the only "core" WM+ game to come out anyway until the Wii is done and gone." We own 4 Wiimotes, and one Nyko Wand+ remote now...though I don't own any WM+ exclusive games. "Just wish that WM+ would be required to ensure devs will actually be using it." If Nintendo would implement SOME standards, instead of NO standards, it would probably help. Wii Sports Resort was released in July 2009, but the FlingSmash WM+ bundle wasn't released until November 2010...basically a year-and-a-half later. Also, now Nintendo is selling the Wii system with a WM+ controller, but NO WM+ game? Makes very little sense to me, especially if they are trying to make WM+ a new standard and get Wii owners playing/seeing how great WM+ is. So, I didn't forget about FlingSmash, as a matter of fact I track it weekly, but there's not data to even report for it yet. "wow, people will play anything. That game is horrible, even by Wii standards"
Just remember how many Wii consoles have sold, and also the demographics of the audience that purchased a Wii...it's probably very different than the PS3/Xbox 360 demographics were a year ago. Does that mean you traded it off, or are not sure where it currently is? Thank you all for the comments/feedback so far! Feel free to join the discussion if you have any more feedback on the topic. As I just commented on the other post I think there was too large of a gap between the games now that the Wii is sliding down the hill to sunsetville. Plus, even if the new one is great, you're going to have less people that need another mote. WiiWare Wednesday: Has the Castle Been Defended?